At NEWCO we utilise state of the art Fronius Welding machines. This improves Tig & Mig quality to cover all aluminium welding requirements: from very thin material right up to 16mm thick aluminium. We also have a WIA fabricator welding machine for our general welding requirements. With the right equipment and decades of experience in the industry, Newco alone can skillfully facilitate your aluminium welding requirements. Our team is known for precise results and excellent communication with our customers, treating every project with the care it deserves. 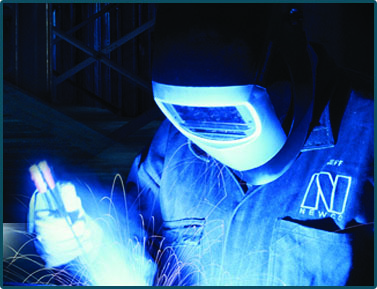 Newco offers all welding procedures required for SP welding of your project if required. We even have a third party weld inspector onsite monthly to inspect our high quality projects. This ensures we’re always performing at our best and you, the customer, are the eventual recipient of these highest standards. We are soon installing the latest Robotic welder to meet our production requirements. This will bring even more consistency and quality of weld, repeatability, greater cycle speed and reducing costs to your end project. Whatever the scope of your project, we’d love to be of assistance. You can be confident Newco will provide the professional aluminium welding services required to achieve your desired finished product. Contact us today for a free consultation.